It’s a typical Monday morning. You’re on your way to your office when an emergency announcement interrupts the local news program. An explosion has decimated a dry cleaning establishment near your business. Police have cordoned off a one-block radius and all traffic is being rerouted. As you get closer, you see that all your office windows have exploded and fire crews are spraying foam over the remains of your computer equipment. This isn’t the time to wonder if you have a disaster recovery plan in place. Fortunately, if you use awesomecloud, you know your data is backed up. But what about your most valuable asset, your people? Assign an emergency management coordinator. He or she will be the main point of contact to employees, vendors, and the media. Keep a list of critical vendors such as delivery services, building owner, property manager, alarm company, to notify in case of disaster. Notify key customers of the incident. 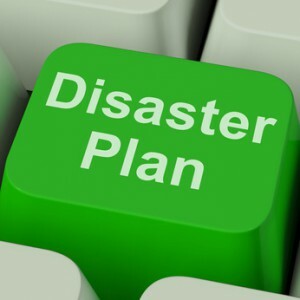 Every company should have a detailed disaster recovery plan (DRP) to follow in case of a tragic event as described above. There are no guarantees that human error, hardware failure, or natural disasters won’t affect your business. It is estimated that 80% of businesses that don’t have a DRP never open their doors after a disaster strikes. Be prepared before disaster strikes to avoid an interruption in your business operation.